You are here: Home / Education / How many gray whales visit Laguna San Ignacio? Each year at this time LSIESP researchers are making plans for the next winter of gray whale research at Laguna San Ignacio. 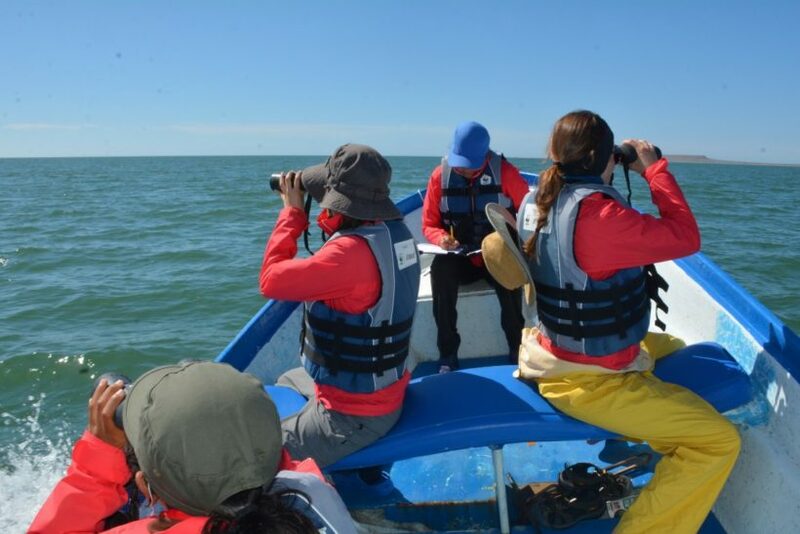 One essential aspect of gray whale conservation is the monitoring of the number of whales that utilize Laguna San Ignacio each winter, and determining how their use of the lagoon changes over the years. We use “boat-based” visual surveys to count the number of gray whales that occupy the lagoon during the winter months. Each winter we begin the surveys in mid-January which continue until the end of each winter season in mid-April. We complete a new survey every 4 to 5 days. The counts of whales provide a “minimum” estimate of the abundance of gray whales and the number of new calves born that winter, and their distribution within the lagoon. The boat survey methodology was first developed by Mary Lou Jones and Steven Swartz in the 1970’s and 1980’s, and is still in use today. These gray whale surveys in Laguna San Ignacio have been conducted during three separate time periods: 1977-1982; 1996-2000; and 2006 to the present, and they are one of the longest series of abundance surveys for gray whales in Baja California.